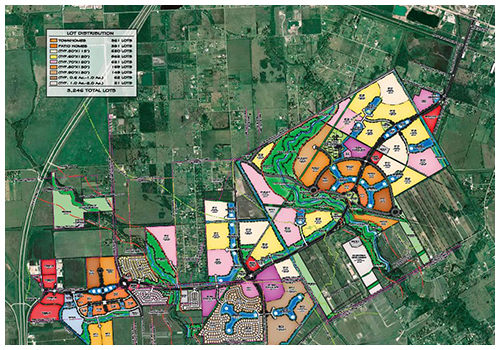 GC Engineering Inc. was selected to provide transportation planning, engineering, drainage design, and utility district coordination for the development of a 2,100 acre mixed-use development in the cities of Iowa Colony and Manvel, Texas. The engineering design included approximately four miles of four lane boulevard parkway on a new alignment with connections to state highways and county thoroughfares. The design also included a trail system with grade separated crossings of the Parkway in several locations. The project also included the study and design of bridge structures at four locations. Drainage and utility design work included a preliminary master drainage plan and impact analysis; storm sewer, sanitary sewer, and water system trunk-line design; calculations; and modeling. GCE also performed hydrologic and hydraulic modeling and drainage study to ensure no adverse impacts would materialize on both upstream and downstream channels. The project required extensive drainage design. GCE prepared a master drainage plan, a detention design, a floodplain design, and analyzed potential impacts on Chocolate Bayou and its tributaries. A complicated ICPR 3 model was developed to simulate hydraulic routing of 41 proposed interconnected lakes. HEC-HMS and HEC-RAS models were created to generate hydrographs and channel routing while HEC models for Chocolate Bayou were revised to incorporate hydrologic and hydraulic changes. The final HEC models for Chocolate Bayou demonstrated that proposed development would impact no receiving channels adversely. Bridge scour analysis was also conducted to simulate four proposed bridges along Seven Oaks Parkway design.